Note: Monitoring for HP Storage B-series Switches and HP B-series Switch Device Management Software has been discontinued from this version. So we have these changes described in the web site which is not so bad. On first look definitely there are changes for a new major version but let’s look a little bit deeper. Inspired by Marnix Wolf’s blog posts of Dell MP Suite I will try to review this MP in a similar way using MPViewer 2.2.1 and MPBA (Management Pack Best Practices Analyzer). MPViewer enables you to take a quick look into any MP in order to see what it does and how. No, it won’t protect you totally from nasty and unwanted surprises but it will rule out the most nasty ones, like Discoveries which run way too often for instance. When such a thing is at hand you know exactly what overrides to make and when overrides can’t be set, you simply don’t import that MP. Another nice thing of this tool is you’re able to export the view dump to an Excel XML file (makes it more easy to filter, count and to sort everything since per topic a tab is created) or as an HTML file making it easier to get a quick overview with the underlying code, thus revealing more information compared to the Excel XML file which doesn’t show the underlying code. MPBPA is the tool which checks to what extend any given MP adheres to a set of Best Practices for MP Authoring. It’s part of the MP Authoring Console used for MP development in the days of SCOM 2007. Even though it’s a bit outdated it’s still a good tool to give you an insight into the overall build quality of any given MP. So we have full support for the current and previous version of SCOM which is great. There are lot of customers who still have SCOM 2007 R2. Nothing is mentioned about SCOM 2012 SP1 because it is still in Beta but I’ve managed to install the MP on it without a problem so I guess there will be no issues with SP1. Of course do not try this scenario on production environment because it is not supported by HP. As the MP is supported only on SCOM 2012 and SCOM 2007 R2 so Windows Server 2012 is still not supported. Again I’ve managed to install this MP on Windows Server 2012 without issues and as it is simple application probably there is no reason not to be working on the latest Microsoft Server operating system. Of course do not try this in production environment. As you can see there is no information on what version of firmware you should have in order this management pack to work which is quite disappointing. I can only guess that only the latest firmware versions are supported because for example on HP 3PAR StoreServ Storage and on HP P2000 MSA Storage SMI-S service should be running on 5988 port in http mode. For other requirements look at the guide that is coming with the management pack or at my previous article about this MP. When I’ve download and extracted the files they are in the same structure and number as in the previous version – One MP guide, installation file for HP Storage Management pack and installation file for WEBES Listener. When I’ve started the installation of the MP I’ve noticed a lot of differences. In the guide there is information how to find the right path. The management pack has been supporting these two path in the previous versions but it was only described in the documentation and it was not provided as option in the installation wizard. Indeed the separation of the MPs matches with the installation wizard also. I now have only imported the management packs I need. 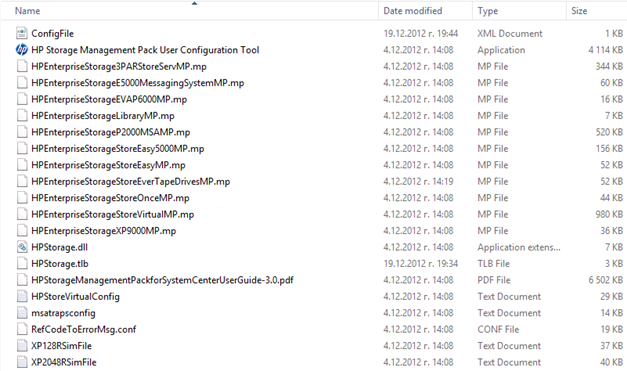 It is great that the non-selected management packs are extracted in the installation folder. That way if you want to add a new kind of device for monitoring you can only import its management pack in SCOM. In the guide for HP Storage management pack I didn’t saw if upgrade of previous version is supported. However even if it supported I will strongly recommend to write document every overrides you have made in your environment for the previous version of this MP. When you have that documentation it is better to remove the old version first completely by uninstalling it and deleting the management pack from the SCOM console. After you complete that task you can install the latest version, select only the management packs you need and make the same overrides you had in previous version. If you had some routing of alerts from SCOM to SCSM based on custom properties now it is a good time to change that routing based on management pack name of course if that fits your case. Before we review every MP one by one let’s see how MPs are referenced against each other. As we can see HPEnterpriseStorageLibraryMP is the main management pack and all other MPs are referencing it. So this management pack is only used as container for other views defined in the other MPs. The warnings generated by MPBPA show that views are not sorted correctly and management pack elements do not have display names. Not so serious warnings but the fact that this MP contains only views and they are not sorted correctly shows negligence by the developers. This management pack monitors HP StoreVirtual Storage Arrays. This MP contains total number of 149 classes, 8 discoveries, 1 group, 96 unit monitors, 33 rules, 132 dependency monitors, 160 relationships and 4 views. All these errors and warnings hints that best practices are not used and this MP could affect the performance of your SCOM environment. I suspect that all MPs will have the same errors. This management pack monitors HP StoreOnce Backup. MPViewer shows 1 class, 1 discovery, 9 rules and 4 views. This MP is only used for SNMP alerts and because of that does not have any discoveries or diagram views. This management pack monitors HP StoreEver Tape Drives. MPViewer shows 1 class, 1 discovery,9 rules and 4 views. This MP is identical to the previous one. The share the same code for different devices. The errors from MPBPA are the same also. This Management pack monitors HP StoreEasy 1000 and HP StoreEasy 3000 Storage. MPViewer shows 1 class, 1 discovery, 1 relationship, 68 rules and 8 views. The errors and the warnings are again a lot but not so critical for the performance of SCOM to my opinion. This management pack monitors HP StoreEasy 5000 Storage. MPViewer shows 9 classes, 3 discoveries, 1 group, 6 dependency monitors, 5 unit monitors, 9 relationships, 4 rules and 6 views. This MP is more complicated than the previous one described. The reason behind that is because this one monitors a higher class device. Benefit of that is that you get diagram for the monitored devices. This management pack monitors HP P2000 MSA Storage. MPViewer reveals 15 classes, 3 discoveries, 1 group, 9 dependency monitors, 10 unit monitors, 14 relationships, 6 rules and 6 views. Again not so complicated MP but still have the capabilities to make the diagram of the monitored devices. MPBPA shows the same errors and warnings as the previous described MP which probably means they share the same code. This management pack monitors HP Storage EVA P6000. MPViewer shows 4 classes, 4 discoveries, 4 unit monitors, 4 recoveries, 5 rules and 8 views. This is also pretty simple MP and the reason behind that is because it relies on WEBEs Listener Service. This management pack monitors HP E5000 Messaging System. MPViewer reveals 5 classes, 3 discoveries, 1 group, 5 relationships, 4 rules and 5 views. This management pack monitors HP 3PAR StoreServ Storage. MPViewer reveals 14 classes, 3 discoveries, 1 group, 7 dependency monitors, 8 unit monitors, 13 relationships, 3 rules and 6 views. As a lot of changes are introduced in this management pack it seems it is written pretty decent. This management pack monitors HP XP 9000 Storage. MPViewer reveals 1 class, 1 discovery, 6 rules and 4 views. Shoul be provided and for 3PAR StoreServ Storage and P2000 MSA Storage the account have to have SMI-S rights. As a summary of all the changes introduced in this major version of HP Storage Management Pack I can fairly say that HP are on the right move. Making so many improvements on this MP in such short time shows that they are determined to provide better added value to their storage products. When you compare this management pack with the other management packs from HP you can clearly see that they are trying to provide the same experience in all management packs created by them. This simplifies the experience of installing and configuring their management packs and increases the experience of using them. With changes introduced we can see that HP 3PAR Storage is the flagmen product of these storage devices and improvements for monitoring it will continue to be developed by HP. I strongly recommend to upgrade to HP Storage Management Pack version 3 if you are still using one of the old ones. The latest version of HP Storage Management pack you can download from here. All the reports from MPViewer and MPBPA you can download from my SkyDrive. 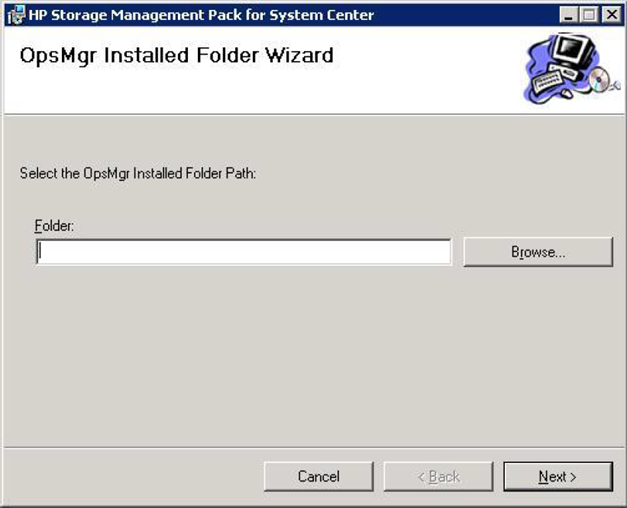 HP storage old MP pack already installed that need to remove .How can remove HP storage MP from SCOM 2007 , what steps need to follow and what is effect to Management point , Root server and other MP. Uninstall the installation. This installation actually just copies the management pack in folder in program files and imports the mp. After you uninstall you have to remove the MP directly from SCOM 2007 console. Any override management pack will also have to be removed. After these two steps you can proceed with installing the new version. Affect on servers will be that you will not have monitoring for your HP storage during that period. Remember that you have to configure the new MP all over again and all overrides have to be made again. Hi Stanislav – Great write up. Did you try installing Collection Point Server? When I tried installing it, it won’t enable the path to select and defaults to C:\ and finally installs under C:\ProgramFils(x86)\HP\EnterpriseStorage. I haven’t seen any service running after this is installed as Collection Point Server. SCOM Agent is running on this machine. How would SCOM agent knows about this server? I couldn’t find what port is used to connect to SCOM server? Also, it is not clear how it works under GW server when it is in untrusted domain with SCOM domain. Traps from Storage Nodes are reaching the server where Collection Point Server is installed. It worked fine after after restarting the server and re-installing the Collection Point Server package on a node that has SCOM Agent running. Test traps from Storage nodes are shown on SCOM server. 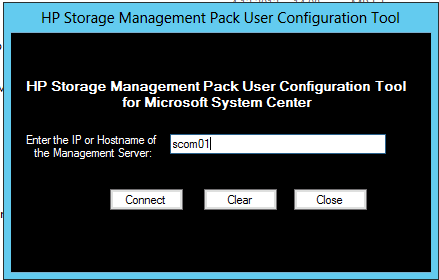 Any idea on which port HP Storage Management Pack User Configuration Tool connects to SCOM server? I am not sure. As it requires a management server I guess that it probably communicates trough the health service on port 5723 or may be it is connecting on a SDK service trough 5724. I have the same problem with SCOM 2012 SP1 installed on Server 2012. I have tried it also on SCOM installed on Server 2008 R2. I have checked If the traps can reach both machines. This is working. But I found in the log of the Health Service this entry. The installation was exactly doen as descripet. Module was unable to execute the notification query. have you fixed your Problem because i have the same Problem. Scom2012 Sp1 on Server 2012.
no, the Discovery is not running.The result is an empty diagram view. SNMP Events are working. I have installed the HP Software on a Windows 2008r2 machine now to get the SNMP part working. The first trial was that I have installed the HP Software on the SCOM MGMT Server which was an Server 2012. The strange issue was that after enableing of the Discovery rule no SNMP traps were received on the Server. Aftzer disableing of the rule SNMP was starting again to receive SNMP traps from the MSA…. in SCOM 2007, the trap are received by the SNMPTrap service under Widnows listening on port 162.
in SCOM 2012, this windows service NEEDS to be disabled (contrary to HP installation guide, referring to old SCOM 2007 way of doing) and SCOM 2012 actually has its own process listening on port 162. What this means is that whilst I am fully able to receive traps or query SNMP from SCOM on manyd devices. Nothing ever occured for D2D Storage after half day testing. As the HP instuction of the manuals are fundamentaly contradictory with a good setup of SCOM 2012 for SNMP handling and because of the classes used by this management pack seems still referring to the 2007 version, I doubt it can ever work. I uninstalled all waiting for HP to release a properly designedmanagement pack for SCOM 2012. I understand your frustration. The MP is not quite easy to setup, the guide could be improved a lot also. In situation with SCOM 2012 I would install the MP and the SNMP service for the MP on a server that is not SCOM Management Server. This is beacuse you will probably use the management servers in a resource pools for network monitoring and it is not recommended to install the SNMP service on them. For those who manage their 3PAR array in Hyper-V environements using SCVMM 2012 SP1; note that there is a new version of HP Storage UI Add-in for SCVMM 2012 SP1. The Stirage Add-in from HP provides you single pane of view for all storage related informations that will influence your decisions from provisioning perspective in SCVMM environement. 1. Provides overview screens containing information of HP 3PAR StoreServ arrays, hyper-V Hosts and VMs. 2. Provides context sensitive in-depth information for relevant volume and their local and remote copies. 3. Provides feature to expand base 3-PAR StoreServ Volumes. 4. Shows Adaptive Optimization (AO) policy details for HP 3PAR StoreServ arrays. 5. Extracts alerts from System Center Operations Manager, generated by HP 3PAR StoreServ arrays. 6. Provide detailed path information of VMs up to storage arrays. 7. Provide information of StoreOnce. 8. Provide option to export the storage details to .csv file. Thanks for the info Amit. I’ve seen screenshots and it looks nice but I never had the chance to try it and review it. Thanks for your feedback. I tried reaching you through your HP email id. Seems its not working any more. Can you contact me over email. Has anybody got this working on an HP EVA ? I have gotten to the Add Storage Device but cannot see my device. There is mention in the Docs that WBES/SEA needs to be installed and configured for command view but the pack (v3)only comes with WBES but not SEA and according to HP you cannot download it individually. Am I missing something? WEBES/SEA is one tool as far as I can understand from the guide. 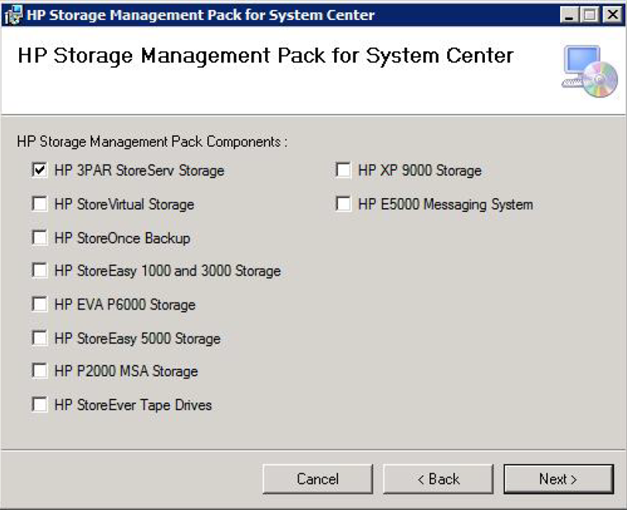 HP Storage Management Pack for System Centre supports only events/alerts for P6000 EVA storage. 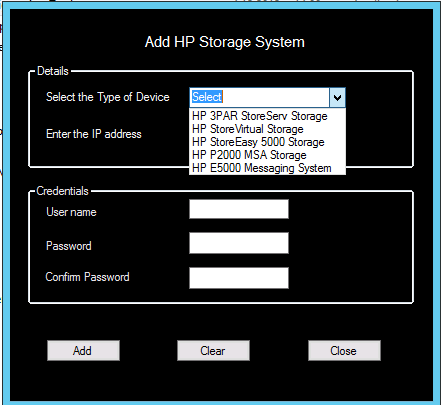 HP Storage User Configuration Tool is used to add the data of Storage devices for Diagram view, since For P6000/EVA diagram view not supported hence entry is not seen. Configure the P6000 EVA to monitor the alerts/event please refer “Configuring the Management Pack for HP EVA P6000” in page 49 describes the details of configuration for monitoring P6000 EVA system. WEBES 6.3 will be available as independent component, will be post the link to the same. Thanks Manju, I will take a closer look. Ended up using the HP Performance monitor which works well but now have the 2003 issue where SCOM just stops logging. Its a known bug but I thought I would try….well it worked for zenoss! Thanks for the post, however I’m hoping you can help me with an issue I’ve come across applying this pack? I’m running SCOM 2012 R2 with v3 of the Storage pack and installed the SNMP Collector on an agent managed server. However when I installed the management packs and enabled the 3PAR SNMP Trap Catcher discovery I did it against the Windows Computer Class instead of the specific server I wanted to target. Now all computers running the service SNMP TRAP are showing as discovered inventory generating alerts of OpsMgr failed to run a WMI Query for WMI events. I tried to stop this by creating a new override for disabling the discovery and setting it to enforce. Then using the Remove-SCOMDisabledClassInstances cmdlet but it’s made no difference. I’ve also tried clearing the cache on individual agents. I would do exactly the same thing you’ve done but it seems does not work. Have you tried removing all overrides related to this discovery and than run the cmdlet? Another option would be to create a group with all servers and make override against that group to disable the discovery. In that group you can exclude the server with the trap catcher. And run the cmdlet again? Third option would be to completely remove the management pack run the cmdlet and add it again. Good suggestion, I’ll give it a go and see what happens. Hi i have a problem with 3.1 version of this MP and was hoping that you could help me with it. I installed the collector on an agent managed server and the management pack (first choice in the setup) on a SCOM management server; added 2 HP P2000 to MP user configuration and their events does show up in SCOM console. the problem is that nothing shows up in diagram OR state view. the storage device just doesn’t show up in scom. i would appreciate any tips to get this to work. If you’ve done that make sure you have powershell on your collection server. If there is not powershell installed you will see Event ID 21400 in Operations Manager Log. If that is not the case look for error in the Operations Manager log on the collection server. It is a local account create on the storage? Should it be a domain account? SMI has been enabled for this account, which other rights/permissions should have this account? on the storage? on the RMS? the account should come from the storage server. When you add your storage device to that tool CI objects will be populated in SCOM. Hey man, thanks for your answer. i looked in the logs and turned out the discovery script timed out before it had a chance to complete. i had 2 devices in MP User configuration tool. removed one of the P2000 and discovery completed and device showed up in SCOM Console. The new problem is that when i try to add a new device in MP User configuration tool ( the device i previously added without any problems) it shows that the device timed out. in system central forum you talked to a guy who had a similar problem and the port was causing the issue. do you have any idea have can i fix this one ? Unfortunately not MJ. The best way is to raise case to HP Support as this is their script. I wish HP to increase the quality of their MP, but as they have their own tool for monitoring, my guest is they not give much importance to it! I know some of the people who are working on this MP and I can tell you they definitely want to improve it and listen to any feedback they have. 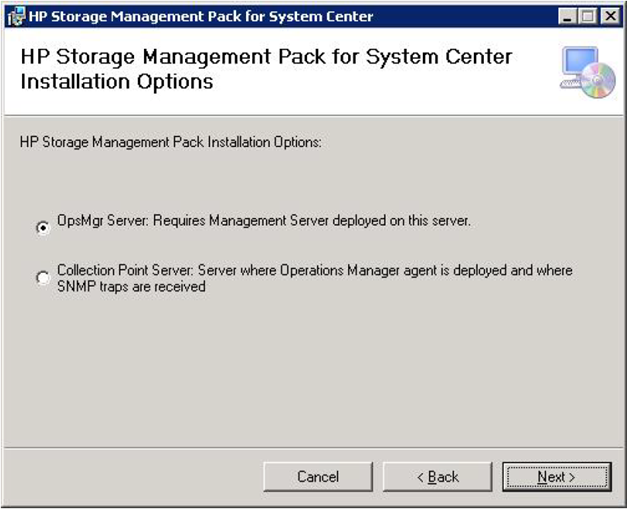 My name is Amit Kumar and I manage the HP Storage Management Packs for SCOM. I wish to inform you that we are working on fixing the EVA alert monitoring through IRS instead of WEBES. Regarding the MSA P2000, we plan to continue alerts monitoring and topology view through the robust SMI-S Provider. I wish to work with you directly and hence request you to mail me directly so that we can take this discussion forward. We are continuously aspiring to improve the customer experience in single pane monitoring of HP Storage systems though SCOM. Hi Amit, Any chance That you have a solution to my problem? My problem was that when i had 2 devices in MP User configuration Tool the script would time out before it had a chance to complete (2 MSA P2000). when i removed one of them from MP USer Configuration, the other one was discovered in SCOM Console. now when i want to add another device to MP user configuration, it just times out. 2 comments higher i explained this in detail. Please log a call at HP support and I will be glad to assist you, we also need to check the model #, f/w versions etc for your setup. Is the discovery of MSA behind a gateway server and SCOM and MSA are in two different subnets? What is your discovery interval seconds before timeout set for the MSA rule ? How to monitor P9500 Storage? We want to monitor the IO performance , free space of the pools etc.? If that is not in the latest version of the Management pack please contact HPE support. I am not affiliated with HPE. Currently you can only monitor SNMP alerts for P9500 in SCOM .